Of course for all of us living as expats in Spain, living and shopping locally is important – contributing to the local economy and helping to boost local businesses and jobs. This is our home, and the health of the local retail sector will always be a vital factor in our lives. We live in a small town though, and you just can’t get everything you need down at the market/supermarket, or even the shopping mall. Running a business from home you need all sorts of stuff, and until now we used Amazon a great deal. The MRW van had pretty much worn a groove up the driveway to our house, because whatever we needed, Amazon had it, and provided you spent 25 pounds or more they brought it to you for free. Very quickly – that van pretty much pulled up outside as soon as you pressed ‘buy now’ (or within a couple of days anyway). It was easy to filter searches for Amazon’s own or Amazon-fulfilled goods that qualified for the free delivery, and it made expat online shopping very easy and straightforward. Now though, everything has changed. Very quietly and discreetly as of a week or so ago, free Supersaver Delivery to Spain – and a number of other countries – has been dropped completely. Free delivery will be honoured on any orders placed before the 11th June 2013- but after that, forget it. All snuck out under the radar, in stark contrast to the big banner ads a few years ago when the service was introduced. And it’s left a lot of very disappointed customers. Expats and locals from many nations have been vocal on Amazon UK’s community forums and Facebook page, but the sheer volume of UK expats living in Spain put us in a special class of mass let-down and disappointment. In the absence of feedback we are forced to guess at their motivations. Prime suspect is a desire from Amazon for us now to order via Amazon.es rather than co.uk. It’s the only answer that makes sense of the continued free delivery to Portugal and Gibraltar –probably through Spain, ironically, for the cheapest flights. The thing is a global brand like Amazon shouldn’t be allowing their customer service decisions to be the subject of rumour and debate – smaller brands have far lesser client support resources but do a better job of keeping people informed, goodness knows social media makes it easier and cheaper than ever before to set the record straight. Perhaps the powers that be at Amazon are busy on the phone to HMRC, but their customers and ex customers in Spain and other countries would appreciate the courtesy of a response. Meantime there’s a fantastic business opportunity open for any of the courier firms regularly making the run from UK to the Costas, to be come the official Amazon drop-off point, I’d have thought? You would be assured of plenty of business if you kept individual costs right down, and have a willing market waiting to be served. 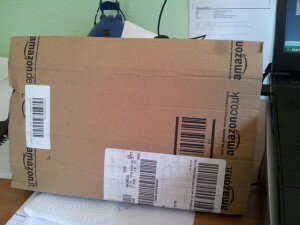 Personally, I don’t have a problem with what Amazon have done. I used to pay for delivery before they introduced the super-saver deal – and I did take advantage of it too! – but if, once again, it means that if I want something that I cannot source here in Spain I have to pay the delivery costs, so be it.